This week over at the Jingle Belles challenge blog its all about peace. They say "our prompt for this week's card is to incorporate a Peace Symbol or the word Peace into your design ... or create a card that evokes Peace for you (snow, forest, etc.)." Honestly, for me peace is a forest blanketed with snow, the scent of burning wood in the air and not a sound for miles. I love to snowshoe through the woods that surround my home and just escape from everything. There is a peaceful calm that overtakes me when I'm out in nature, just enjoying the beauty and wonder of it all. This is what inspired my card. Its a gray, windy day here in southcentral Alaska and the card didnt photograph as well as I wanted it too :( Its so pretty and shimmery in person and I am really happy with the way it came out. I started with a card base of Night of Navy and then added a layer of Shimmery Silver that was embossed with a snowflakes folder. For my forest scene I used silver metallic ink, and I also used the same ink for the sentiment. For just a small pop of color I used Real Red to make a Red Cardinal flying through the sky. I then ran the whole scene through the Cuttlebug with the Swiss Dots folder to make it seem like small snowflakes coming down. Head over to the Jingle Belles blog to check out the challenge and play along! 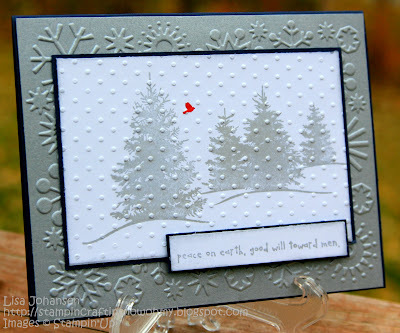 I adore this card ... the silvery shimmer of the winter night ... perfect sentiment ... and the tiny pop of red ... perfection ... thanks for sharing your peaceful experiences with us at jingle belles. Oh Lisa, I think this might be my favourite of yours so far! I love this. every little bit of it. 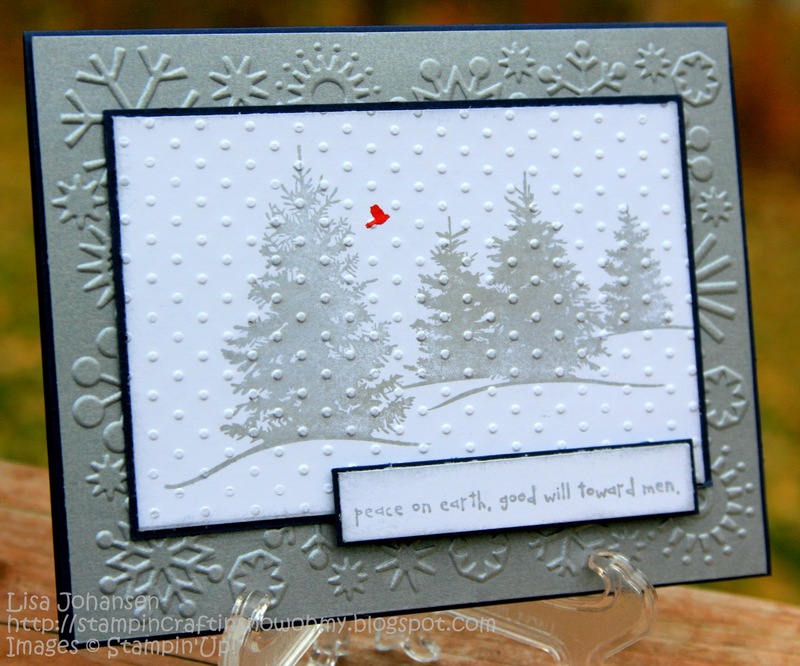 I adore the stamp and the gorgeous red cardinal and the embossing and the super sentiment! Wonderful, wonderful card. This weeks fave for me! This is so peaceful and that little red bird really stands out beautifully. Congrats on the jingle belles shout out! This is a beautiful card!! !